Please Contact us if you have any question or need any help!We will provide the best service to you in 12 hours. With an impressive 99% transparency and anti-smudge coating, enjoy your device's display and high-response touch without any interference. 99 % High-definition clear hydrophobic and oleophobic coating can prevent the water and from scattering. Water and oil can be wiped away very easily. Highly responsive and sensitive touching performance makes your watch function smoothly and work fast. The glass screen protector can be easily installed without bubble and and removed without residue. ☁What You Can Get: 5×Tempered Glass Screen Protector,5×Wet/Dry Wipes,1×Install instructions. 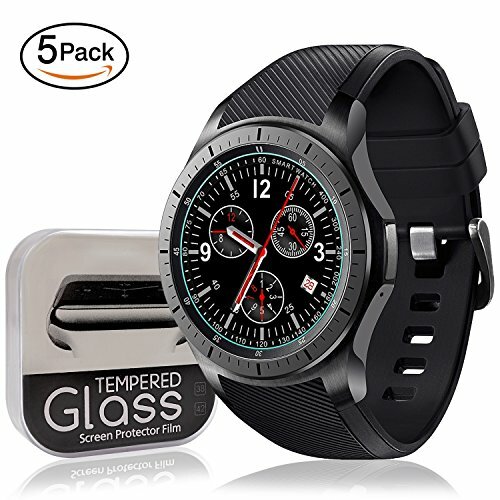 ☁Commonly Used: Designed for Samsung gear S3 frontier/classic,precise laser cut designed specifically to offer max body coverage. ☁Ultra-Clear：99.9% High-definition clear hydrophobic and oleophobic screen coating protects against sweat and oil residue from fingerprints. ☁Easy Installation: Our Samsung Gear S3 screen protector comes with installation instructions, wet and dry wipes. It is extremely well packaged for premium protection. ☁Warrant&Guarantee: From 12 months after the date of purchase, unconditionally refund or resend with any quality problems.Please contacts us with any question or concern. If you have any questions about this product by SYOSIN, contact us by completing and submitting the form below. If you are looking for a specif part number, please include it with your message.